I had just finished a run in the pouring rain and decided to hang my sopping wet shirt on the garage door handle to let it drip dry outside. The bottom step from our porch is only about three or four inches high, not a full step, and when I hit it with my right foot I must have mostly missed because when I landed with all my weight on my left foot, I rolled it inward and landed on my ankle. I’ve walked up and down those steps for 15 years. You’d think I would have them figured out by now. 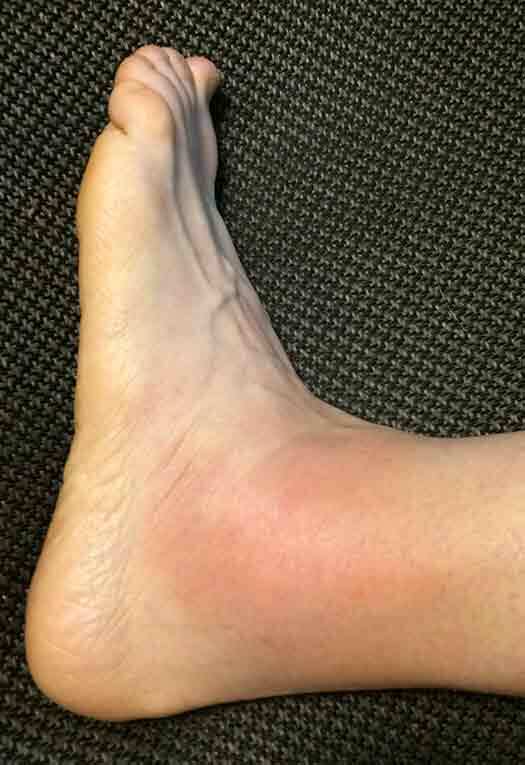 Self-diagnosis is a sprained ankle, but giving it a name isn’t making it get better any faster. Here’s a picture of the day-after ankle. Or, at least, where my ankle used to be. Since this picture I’ve grown and lost a bruise right down the edge line of my foot. I bought an ankle “stabilizer” today because I tried walking my running route yesterday, and I’m thinking I probably shouldn’t have. The doctor isn’t worried and told me to come back if it stops getting better. She also said that biking is perfect for it. So. Doctor’s orders.